Crashpad Lodges sleeps 16 people and is the perfect accommodation from which to explore North Wales. 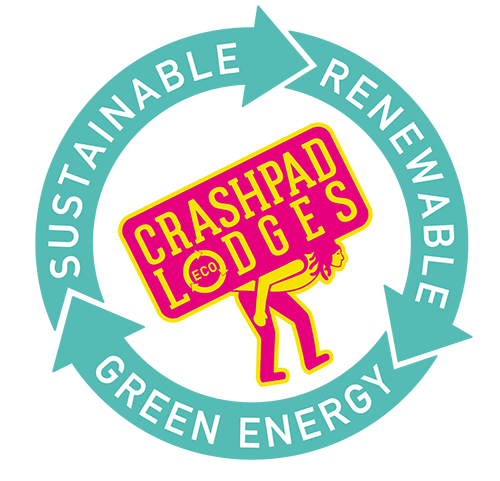 Crashpad Lodges is ran from Yr Helfa, a renovated off grid Welsh Longhouse set in the heart of the Snowdonia National Park, nestled in the foothills of Snowdon. The grounds feature an outdoor BBQ, a fire pit with views for miles, perfect for watching the rising and falling sunsets across the mountains. Underfloor heating, a log burner and 3 large shower rooms ensures a warm and comfortable stay. The kitchen is provided fully equipped for all your self-catering needs with a substantial grill/oven with 5 gas hobs, pots, pans, plates, cups and all cutlery. The kitchen units are carved from recycled wood made by a local master craftsman, along with many of the fixtures and fittings within the Lodge. Food can be ordered and delivered to the lodge in preparation for your stay, please see the booking form for more information. Close by stream for refreshing dips! Crashpad Lodges is conveniently located a 10 minute walk from the start of the Llanberis Path to the summit of Snowdon and backs onto Moel Eliol which forms part of the Horseshoe trail to Snowdon. From the Lodges you can clearly see the Snowdon Mountain rail making its way up and down Snowdon with Llanberis being a short distance away with pubs, convenice stores, and restaurants and cafes.